But we were all sleeping, so we didn't know that. Usually I wake up during thunderstorms, but there mustn't have been much loud thunder because I was sleeping soundly. We were jolted awake by tremendous noise and indescribable turbulence on the outside of the house. Sam later described it as the sound of a bunch of roller coasters. I'm not sure what my first thought was, it was hard to process what was happening, especially just coming out of a dead sleep. We ran first to the babies' room. I guess I wanted to check and make sure everyone was okay primarily, because we didn't grab anyone at that point, but ran down to the older boys' room to check on them. They were groggy but easy to get going when we said that "you need to go down to the basement right now, and move quickly". We did have to wake Noah, but they were all able to go by themselves. Then Brian went back and grabbed the babies and we all headed to the basement, noticing on the way the window in the living room that had blown open (Josiah had unlatched it the day before - maybe he was following the Lord's directions). We didn't notice until a bit later that the other living room window had shattered and glass was all over the living room, as well as plant pieces and roof tiles. We ran the boys downstairs. I was shaking and just in awe of what we experienced, exclaiming to them, "Boys, I think we just lived through a tornado. Jesus just protected us from a tornado!" After a few minutes, I went up to help Brian - he was trying to tape up a tarp to the broken window in the living room. It was still raining very hard and we didn't want the carpet to get wrecked (obviously, we had no idea of the extent of the damage at this point). And the boys were doing fine. They were sitting on the couch downstairs, quietly entertaining the babies and more in "adventure" mode than "freaking out" mode, so I felt fine leaving them down there. In the process of helping Brian with the tarp, I also gave my mom a call to let her know what happened, and as I was on the phone, one of our neighbors pounded on the door and told us we needed to get out of the house because our gas line was broken and gas was hissing out like crazy. Even with 60 MPH winds, the smell was obvious. 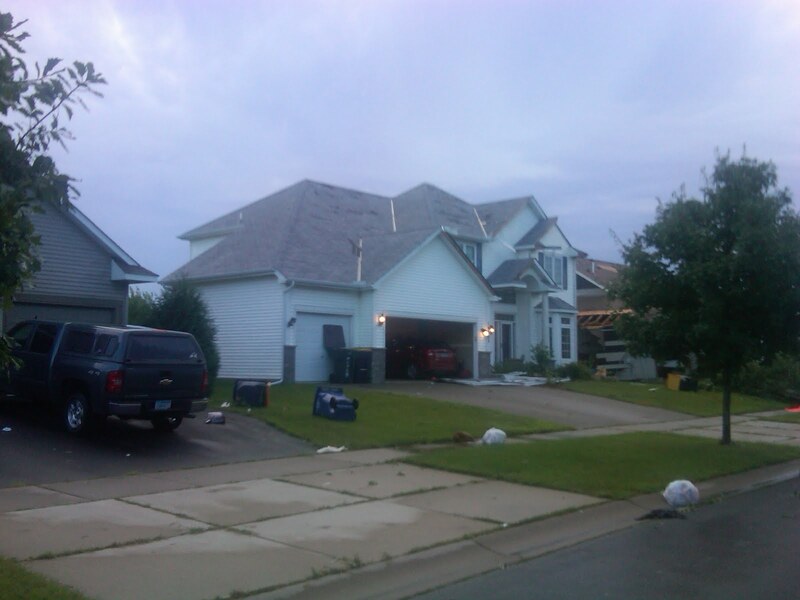 We pretty much threw the children in the van, I grabbed my purse, and Praise the Lord, the garage door opened, and we backed out and parked a few houses away to watch and wait. So there we were, Noah and I in our jammies, Brian, having managed to grab a shirt on his way out, was fully clothed, but Sam and Caleb were in nothing but their underwear. Sam was a bit horrified at first, but that wore off quickly. So we sat and waited. The fire dept. and the police and ambulance arrived and blocked off a couple of blocks because of the gas line leak. They needed someone from the gas company to come out and turn it off, and after telling us that it would probably take a few hours, we realized we needed to get somewhere else. It was a bit scary out sitting in our vehicle and not knowing what the weather was going to do next. The sirens actually went off about 40 minutes after the tornado passed through (no siren at all before). It was also raining like crazy. We got 4 inches of rain that night. We were able to get a hold of some friends from church who live just over the hill from us in the next neighborhood. 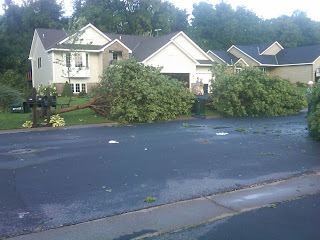 They had damage too - their whole front yard of full-grown trees (3 I think) were gone. Uprooted. One almost completely blocked the street. There was debris everywhere in the road. But then some neighborhoods and blocks were fine that we saw driving over. Untouched. Anyway, they allowed us to crash in their basement for a few hours. Neither Brian or I slept. Sam and Isaac didn't sleep either. 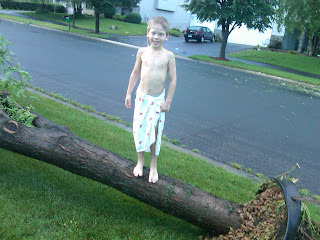 So after it started to get light, we took them outside to walk around and survey some of the wreckage up close. Sam did so with a baby blanket wrapped around his waist like a toga. Around 7:00 or so, Brian and I went back to our house to check things out there and see if they'd shut off the gas yet. 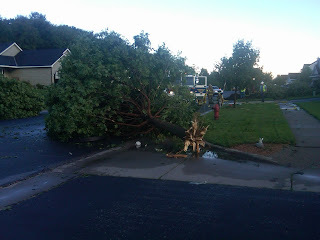 The street in our area was still blocked off, but we were able to drive around the block and get close. The neighbors around us had what appeared to be far worse damage than us. Behind us, where "Shooter" the dog lives, the entire roof almost caved in - a good portion of it. 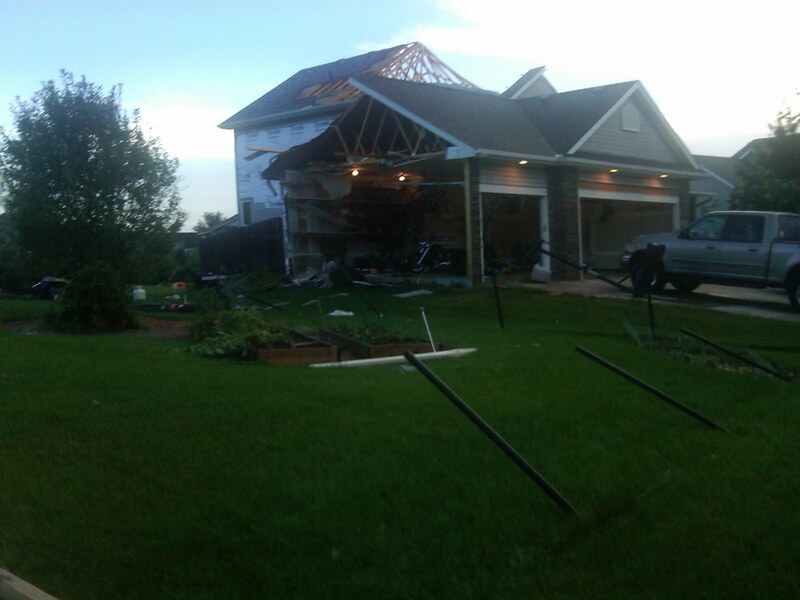 And they lost 2 sides of the garage. The neighbors on our south side had a near-collapse of their garage - it will have to be torn down and rebuilt. We had a huge mess of junk blown into our yard from the garages that were exposed. Individual tools - screws, nails, small screwdrivers (imagine those things flying through the air at 100+ miles per hour). We could see our patio table out back, it wasn't even knocked over, just in a different spot, but all the tiles on it were gone and many were found around the house broken to bits. Our patio chairs were warped badly, and one was found wrapped around the neighbor's tree. 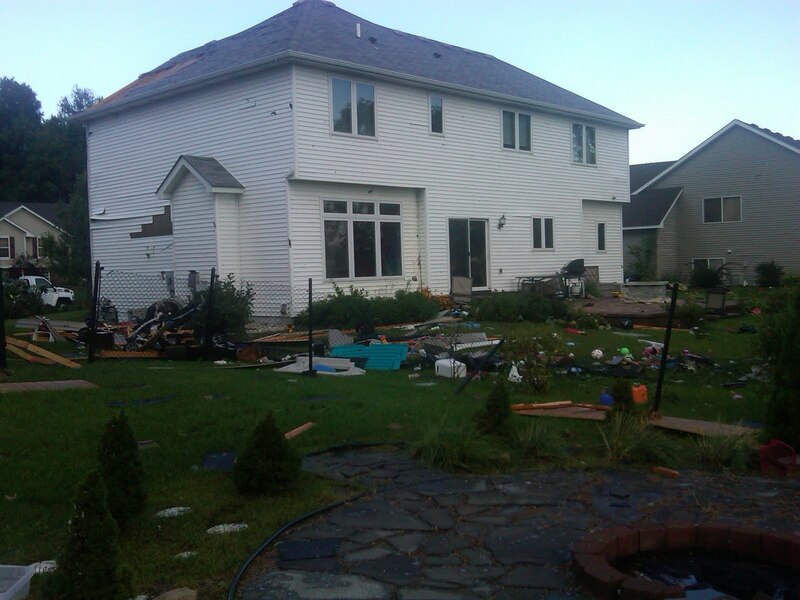 The damage to the house was yet to be discovered. But they finally got the gas shut off and the firemen went in to take a reading inside the house to make sure it would be safe for us to enter and grab some things. I grabbed the camera about 10 minutes after the tornado went through. Glass and leaves on the floor. You can't see it in this picture, but the window that was "blown" open is cracked as well. 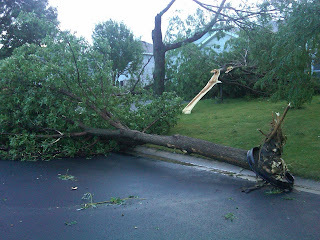 One of the trees that was uprooted at our friends' house where we were in the early hours. Notice the split tree behind as well. Sam was proud of himself in his little toga. In our friends yard. 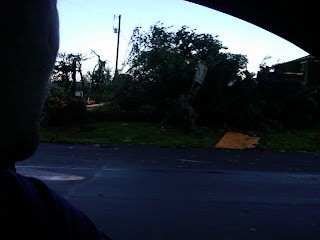 Trying to capture shots of the damage as we drove back to our house. Trash bins all over the place. First daylight glimpse of our house. How many wrong things can you spot? The neighbors behind us where "Shooter" the dog lives. 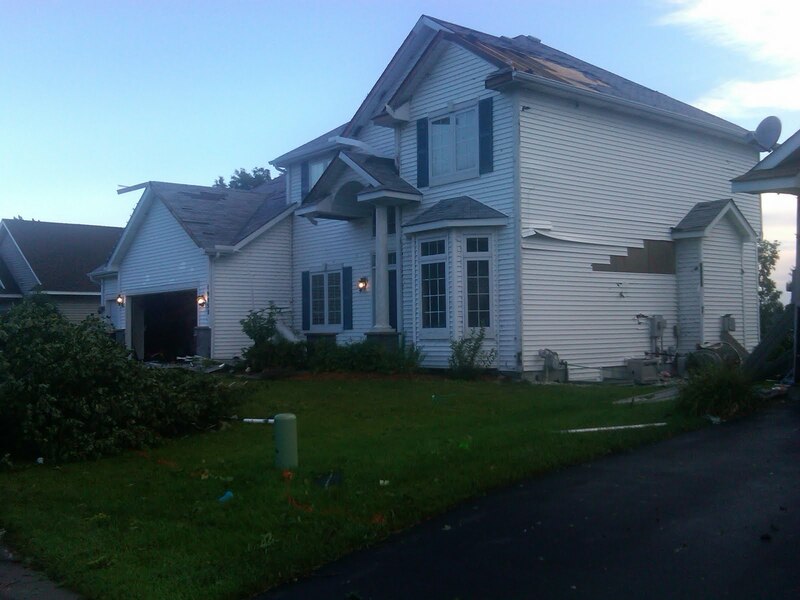 Extensive damage. 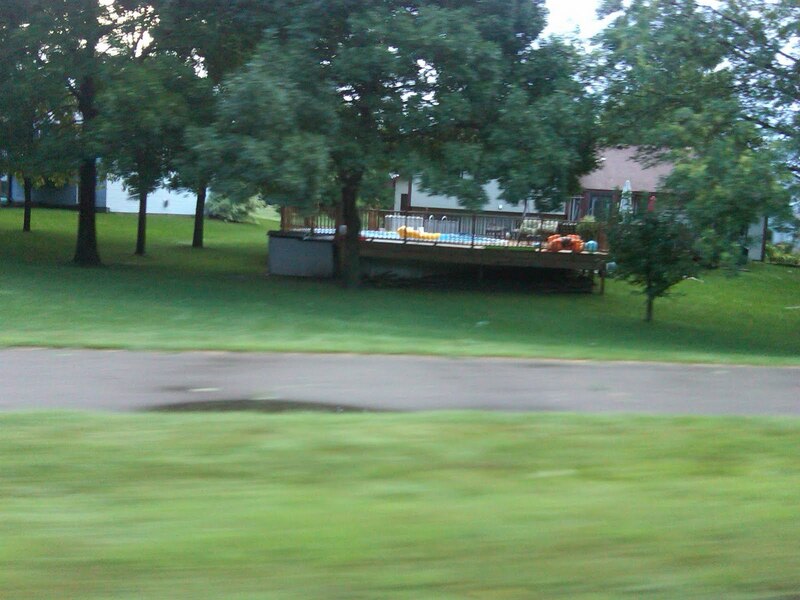 You can see our neighbor on our south side lost their fence. 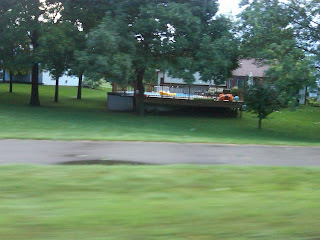 Some people don't know how to take care of their yard. And so began the second phase of our surreal day.